Adelaide: India selectors are expected to choose between specialist batsman Rohit Sharma and all-rounder Hanuma Vihari for the series-opening test against Australia in Adelaide starting Thursday. Selectors have opted for Mohammed Shami, Ishant Sharma and Jasprit Bumrah in a strong pace attack for Adelaide Oval, as Virat Kohli's side bids to become the first Indian team to claim a series win Down Under. Top order batsman Murali Vijay, who was dropped following the second test against England at Lord's in August, was also included. The surface looked dry the day before the match and there is hot weather predicted for the first day, then warm, sunny conditions throughout so spin could be a factor. Kohli averages 98.50 at Adelaide Oval with three centuries. India have won just five of their 44 Tests in Australia - they won in Adelaide in 2003-04 on the back of Rahul Dravid's tour de force and Ajit Agarkar's six wickets. 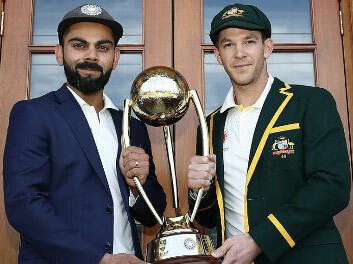 Adelaide's previous three Tests have been day-nighters, but India didn't fancy one of those on this tour so it's the ground's first traditional Test match since 2014 when these two sides last met.